A small wooden raft is used to cross a stream to reach Koh Chbar village. Five years ago, newly-graduated midwife Chande Nhek made her first visit to the remote village of Koh Chbar to provide health care services to villagers. The Sambo Health Centre she operates from is only accessible by journeying down a 20 km bumpy, narrow road and then by raft across a small stream. It is situated 60 km from Kratie town in the north-eastern region of Cambodia. riding the bicycle and wearing the uniforms received from the Commune Council. 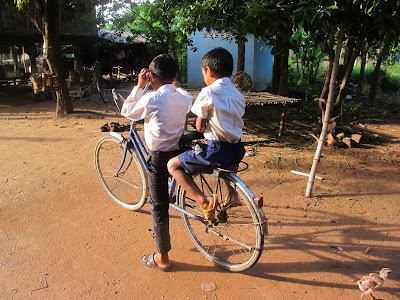 Siem Reap Province, Cambodia, November, 2016: It’s a hot and humid day in Yeang village as 11-year-old Sovann* bikes home from school down a dusty lane. In a white shirt and dark pants, the Grade 3 student looks like the average Cambodian schoolchild. But tragedy struck Sovann and his younger brother, Sambath’s*, life in 2014. During a domestic dispute, their mother was killed by their father. With the father now in jail, the boys’ grandparents have stepped in to care for the children. Sovann was born in Yeang, a village about 45 kilometers from the provincial capital of Siem Reap, in 2005. Sambath arrived in 2009. Soon after the younger boy’s birth, their parents, farmers who struggled to support their family with a small plot of land, crossed the border to Thailand in search of better paying jobs. They worked in construction, under difficult conditions, taking the two boys with them. This is a choice many Cambodians make, in the hopes of more money and a more secure future. With the detention of her mother, and her stepfather abroad, Reaksmey decided to go to Mith Samlanh for help. 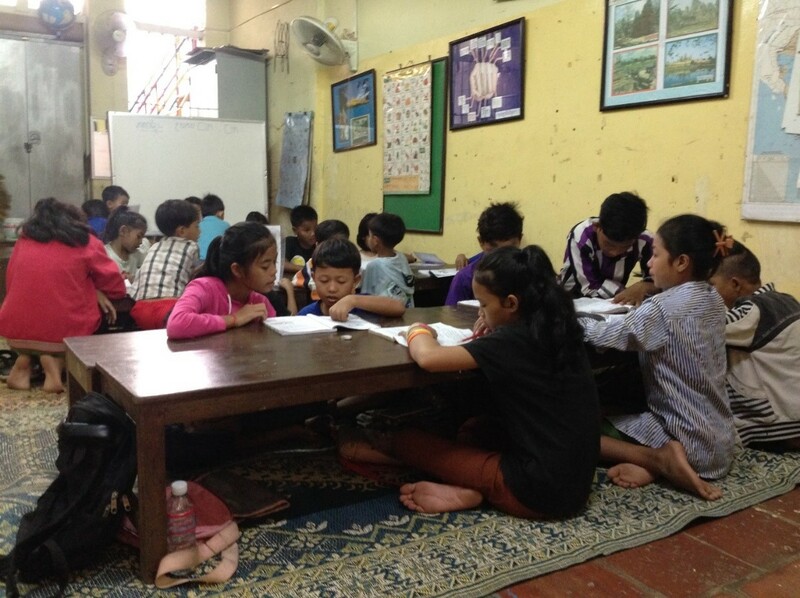 She had heard about the organization in Toul Kork, in Phnom Penh, where a woman saw her selling fried potatoes and chicken wings and asked if she was going to school. Informed about her situation, at that time, Mith Samlanh provided Reaksmey and her siblings with food, and covered the costs of rent, water and electricity for their home. Reaksmey was also enrolled in the remedial classes run by the organization. Meas Vanna with her 6-year-old student, Mao Ess Ter outside their classroom. Mao Ess Ter has had trouble reading and writing because of her low vision. Phnom Penh, Cambodia, December 2016: At 57, Ms Meas Vanna has had a long career as a school teacher in Khan Russey Keo, a suburb on the dusty outskirts of Phnom Penh. For more than 30 years, she has taught children at both primary and preschool levels. But in all her years, she remembers not one child with a disability ever entering the gates of Boueng Chhouk school. “Well, thinking back, there was once a child many years ago who I remember was unable to speak but she did not stay in school long,” Vanna said. 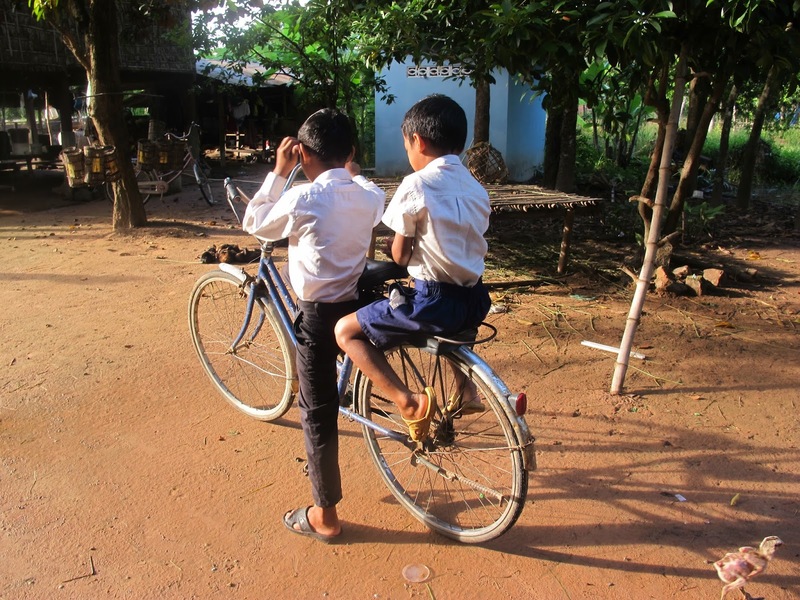 Children with disabilities often remain “invisible” in Cambodia, in many cases hidden from society, hidden from social support services and even hidden in official data and statistics.